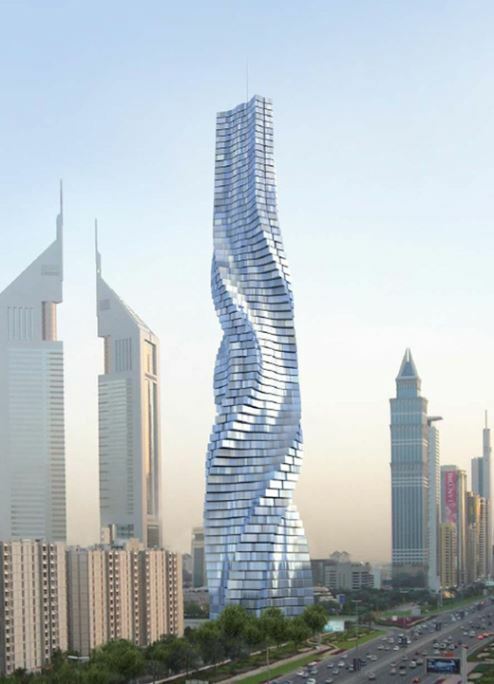 Dubai has revealed plans to build the world’s first rotating skyscraper. Ideal for those who easily tire of their view, the 420-metre-high Dynamic Tower will be built in four dimensions and will constantly change shape. “It will never look the same,” said Israeli-Italian architect David Fisher, who recently spoke about his plans for the rotating tower on YouTube’s Your Discover Science channel. The US$700 million Dynamic Tower will feature floors that can rotate independently of the rest of the building. Each apartment can rotate 360 degrees independently and the speed at which it moves will be adjustable. A stationary core will feature the structure’s elevator, with each apartment connected to this centre piece. Remarkably, this one-of-a-kind tower will also feature wind turbines between each floor, which Fisher said would translate to free electricity. "It is a green power station. It will power the entire building," he said. Tenants will also be given the option to customise their own view, but it will come at a hefty cost – of around $30 million.